There is only one photograph of a Hummel self-propelled gun (SPG) chassis and body fitted with an artillery 10.5cm le.F.H. 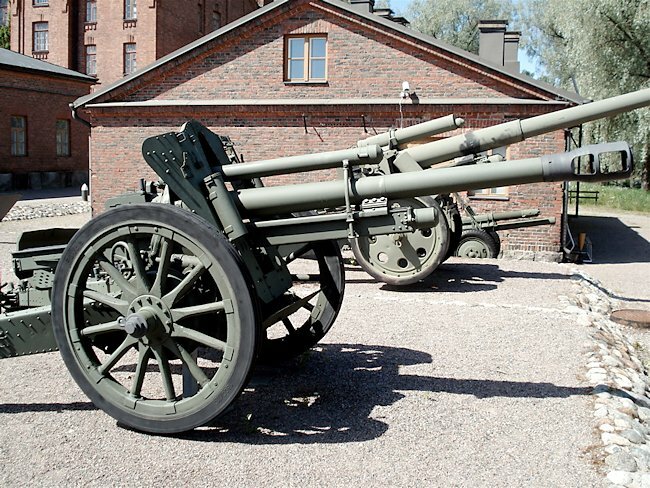 18/40 L/28 howitzer rather than the normal 15cm s.FH 18/1 L/30 howitzer. It was officially called the Hummel-Wespe. This name was used on the Stahlindustrie construction company’s documentation. It was also known as the 10.5cm le.F.H. 18/40 (Sf) auf Geschüetzwagfen III/IV. The photograph was taken after World War Two during the winter of 1945/46 at Košťaty near Teplice, Czechoslovakia, close to the factory that assembled the vehicle. 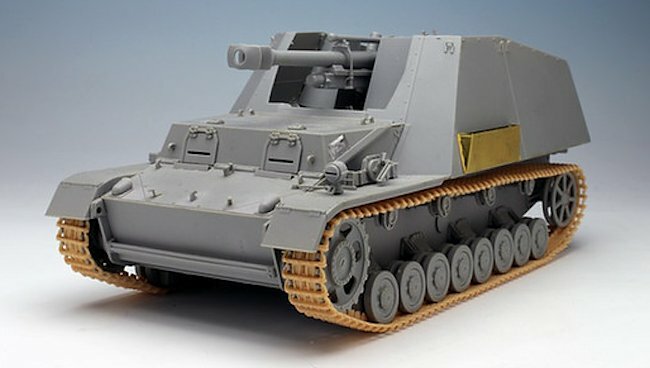 The Hummel SPG used an extended tank chassis called the Geschüetzwagfen III/IV to mount the 15cm s.FH 18/1 L/30 howitzer. The engine was moved from the rear of the tank to the center of the vehicle to make room for the gun and the armored fighting compartment at the back of the SPG. The 10.5cm leFH 18/2 (Sf) auf Geschützwagen II ‘Wespe’ (Sd.Kfz.124) artillery SPG used a Panzer II tank chassis. Production began in February 1943 and ceased in June 1944, when the main factory in Warsaw, Poland was captured by the Red Army. The German Army Panzer-Artillerie batteries still needed more self-propelled guns that could keep up with the Panzer Divisions, fitted with 10.5cm le.F.H. 18/40 howitzers. 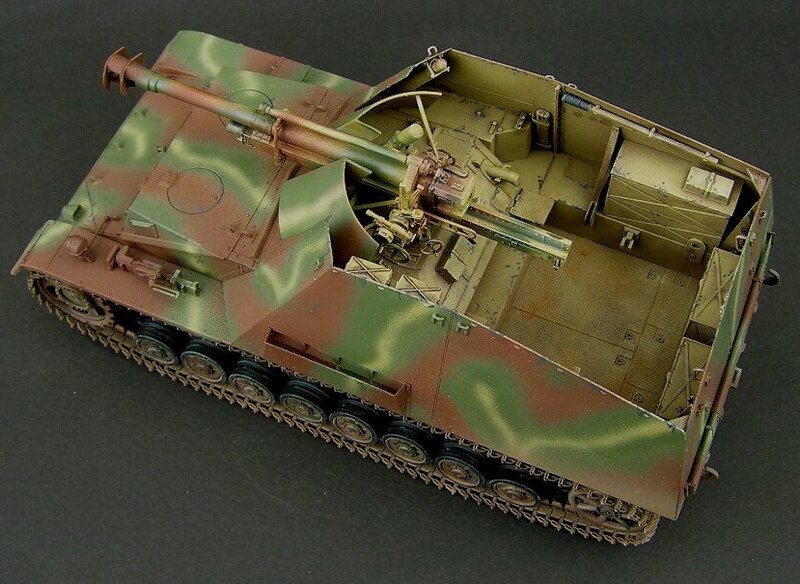 The Geschuetzwagfen III/IV was still in production and being used for the Nashorn 88mm anti-tank self-propelled gun as well as the 15cm Hummel SPG. A decision was made to mount the 10.5cm le.F.H. 18 howitzers gun used on the Wespe SPG onto the Geschuetzwagfen III/IV chassis. The German armaments company Deutsche Eisenwerke (D.E.W) were constructing Geschuetzwagfen III/IV chassis at their assembly plant in Duisburg, Germany. Allied bombing was making production difficult. It was moved to the D.E.W plant Werke (Deutsche Eisenwerke AG Werk) Teplitz-Schönau in Czechoslovakia (now known as Teplice, Czech Republic). The building of armored vehicles for the German Army continued until the end of the war in May 1945. Plans to fit a 10.5 cm Le.F.H 18/40 light field howitzer to the s.Pz.Haubitze Fahrgestell extended and modified Panzer III/IV tank chassis, as a stop-gap solution to send more 10.5 cm artillery SPGs on the battlefield, were discussed in a meeting on 2nd December 1944. The factory was expected to produce 40 in February, 50 in March and 80 in April. A further report documents the demand for a further 250 to be built in June 1945. That report was dated 9th January 1945. A Stahlindustrie report dated 30th of August 1945 stated that one Hummel-Wespe artillery SPG had been built in December 1944, a further 9 in January 1945 and a further one before the end of the war, bringing the total to eleven. No German Army documents have been found that show these vehicles entering operational service or being used on the battlefield. Another unusual feature visible in the photo of the Hummel/Wespe is the hand grenade protection screen that was added over the open fighting compartment on a metal hinged frame. This is a photograph of an early version Hummel, not a Hummel/Wespe. It is fitted with the same wire mesh top screen to prevent grenades and mines from being thrown into the fighting compartment. Notice the large exhaust muffler/silencer box under the rear hatches. 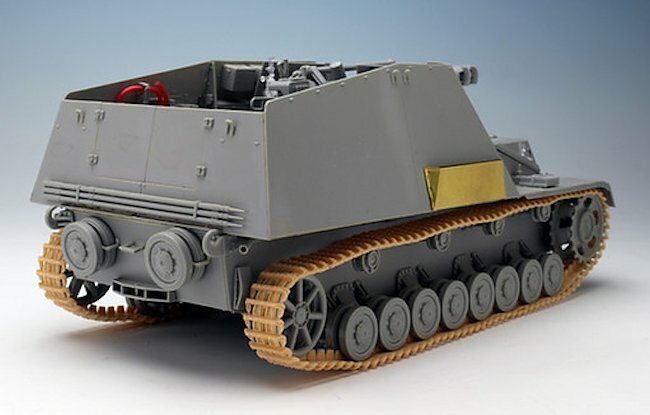 It was removed on the later version of the Geschützwagen III/IV chassis that was used on the 10.5 cm le.F.H. 18/40 Hummel-Wespe artillery SPG. A German document was captured by the Red Army. 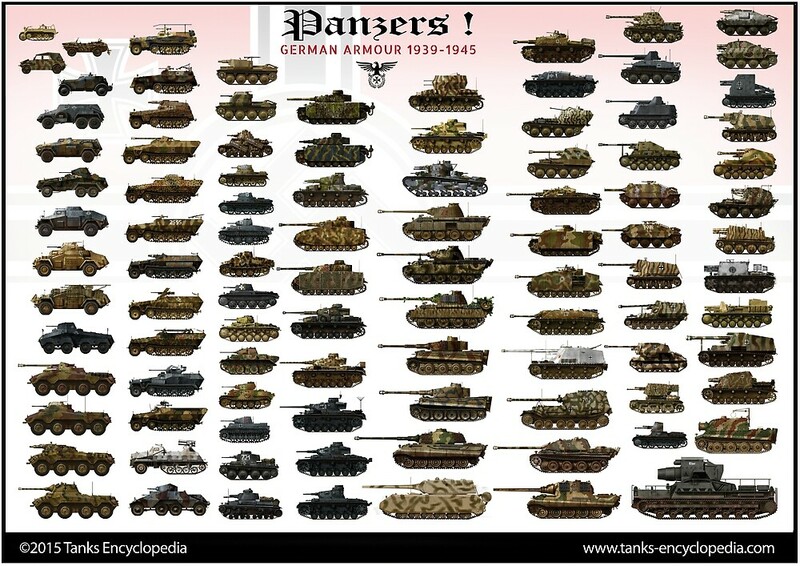 It showed predicted production numbers of vehicles like the Jagdpanther, Jagdtiger, Flakpanzer, Hummel and Hummel-Wespe from March 1945 to August 1945. It was translated by Senior Lieutenant Rubinshtein into Russian and kept in the Soviet archives. On line 345, it shows that planned production of the heavily armed howitzer, the Hummel, was for 50 vehicles: 20 in March and 10 in April, May, June 1945 with production stopping in July. 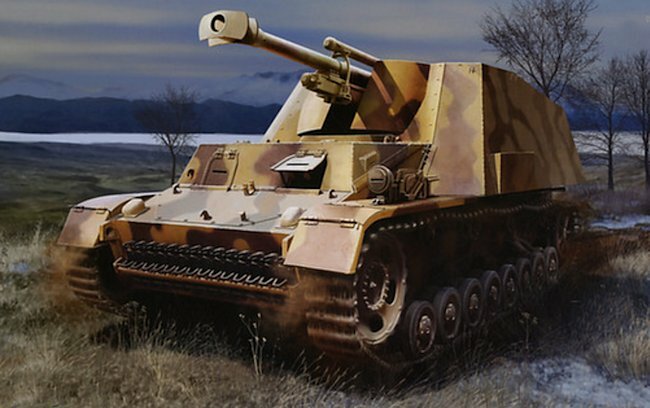 On line 346, it shows that planned production of the light armed howitzer, the Hummel-Wespe, was for 190 vehicles: 20 in March and 30 in April, May, June and 40 in July, August 1945. There was a side note that an additional 10-20 new type Hummel/Wespe would be added to the number on April and May. This would have brought the planned production numbers of the 10.5cm Hummel-Wespe Artillery SPG to 220 vehicles by August 1945. Obviously, that did not happen as the war ended in May 1945. It has been impossible to confirm the total number built. Eight vehicles are known to have survived the war. 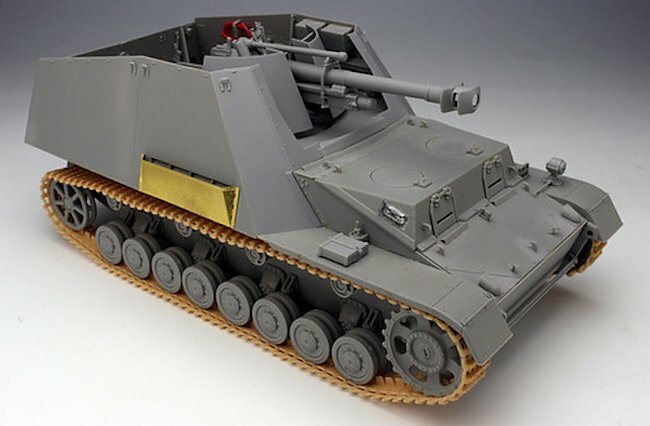 Czechoslovakian Army records recorded the original German production chassis number (Fgst.Nr) of the eight Hummel-Wespe artillery SPGs that entered their service. The full designation of this self-propelled artillery gun was Panzerfeldhaubitze 18M auf Geschützwagen III/IV (Sf) Hummel, Sd.Kfz. 165. The German word ‘Hummel’ means bumblebee. This armored fighting vehicle had a nasty sting. There were two main types of self-propelled guns in the German Army during WW2. One was fitted with an anti-tank gun and the other with an artillery howitzer, like the Hummel. A vehicle fitted with an artillery field howitzer was called a ‘Geschüetzwagen’, which is literally translated as a ‘gun vehicle’. The letters ‘Sf’ stand for ‘Selbstfahrlafette’ – self-propelled carriage. ‘Panzerfeldhaubitze’ means armored field howitzer. Self-propelled artillery guns were developed to enable fast moving attacks to have artillery support that could keep up with the speed of advancing Panzer Divisions. They could use direct fire mode at targets they could see or, more commonly, use indirect fire at targets plotted on a map. The open-topped back design of these self-propelled guns had a number of advantages. The elevated commander’s position when standing in the crew compartment, behind the protective armored shield, meant that he had a good view on all sides. 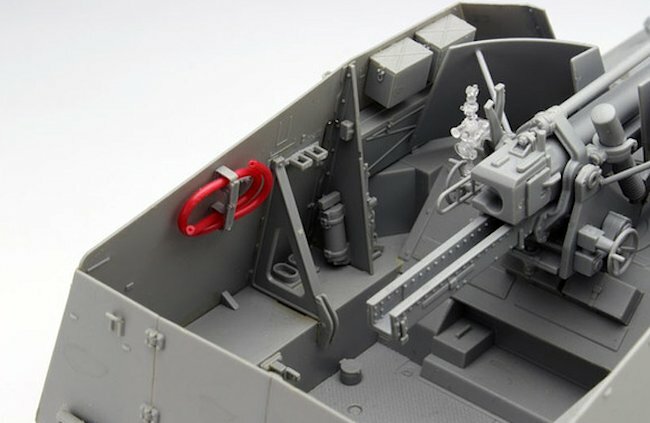 If there was the threat of enemy small arms fire, then the crew could use a twin lens range finder telescope that could peak over the top of the armored casement. Putting the 10.5 cm le.F.H. 18/40 howitzer on top of a tank chassis was a more efficient use of manpower from the traditional form of German artillery battery transportation. Even in WW2, horse power was still widely used although tracked vehicles were also employed when available. Each field gun would require a six-horse team to pull the gun and limber. The ammunition, supplies and kit would be kept in the limber, which was a very large box on a pair of wheels with seats on the top. Three men would ride on the left-hand horse of each pair to control them. The remaining six men of the gun crew would ride on top of the limber. Only a relative few were towed by the 3-ton halftracks. High explosive HE shells came in two parts. The explosive shell was loaded first, followed by the variable charge canister. This meant that the Hummel/Wespe could only carry 18 rounds of HE. It could fire armor-piercing AP rounds but they were only effective at short ranges and used in self defense. The Hummel/Wespe was not meant to be on the battlefield front line. It was a support vehicle that provided artillery support from behind the infantry and tanks. The powerful 10.5 cm le.F.H. 18/40 light field howitzer was mounted on a specially designed Alkett/Rheinmetall-Borsig lengthened German tank chassis called the Geschützwagen III/IV. Components were adopted from both the Panzer III and Panzer IV tank chassis. The more robust final drive wheels, front drive wheels and steering units plus the Zahnradfabrik SSG 77 transmission gearbox were adopted from the Panzer III Ausf.J. The Maybach HL 120 TRM engine with its cooling system, the suspension, and idler with track tension adjustment were adopted from the Panzer IV. The engine was moved from the rear of the tank to the center of the vehicle to make room for the gun and the armored fighting compartment at the back of the SPG. On early versions of the Geschützwagen III/IV chassis, the front top of the hull had sloping armor with a raised armored compartment for the driver on the left of the vehicle. The front hull superstructure and driver’s armored compartment were redesigned in early 1944 and enlarged, covering the whole width of the vehicle. The radio operator and driver now had more space to work in. This design was used on all Hummel/Wespe artillery SPGs. The exhaust system was also changed on the later model. It was moved from the original location below the rear double doors. The exhaust mufflers were dropped and the ends of the exhaust pipes were cut at a slant away from the tracks to avoid stirring up additional dust. The Geschützwagen III/IV tank chassis did not have a hull mounted machine gun. Crews were issued with a single MG34 or MG42 machine gun, carried inside the fighting compartment, for self-defense. The Hummel/Wespe was designed to be operated by a crew of six: commander, driver and four gunners. They were protected by an enclosed high silhouette armored fighting compartment. Although it was open topped, the crew were issued with a thick canvas tarpaulin cover that could be used in bad weather. In front of the driver, a metal wire grid was fixed into position to aid the driver maneuvering the vehicle in the correct fire position. These were designed to prevent grenades and mines being thrown into the vehicle as it moved through towns and cities. A metal louvered cover ventilated the engine, but many later versions were fitted with an angled shield that opened upward. On the photograph of the Hummel/Wespe the metal louvered engine vent can not be seen on the sides of the vehicle. It looks like it has been fitted with one of the armored angled shields. Three aiming stake poles would have been carried in brackets below the rear door. The gunner would use a large ZE 34 sight. The top lens aperture would point to the rear of the vehicle. The gunner used this aperture of the sight to locate the aiming sticks that a member of the crew had pounded into the ground at the rear at a known bearing from the vehicle, having used a compass (compasses did not work inside a metal vehicle in 1943). By lining up the red and white fire aiming stake, subtracting 180 degrees, he would be able to work out the correct bearing the gun barrel is pointing towards. The upper fighting compartment superstructure walls were constructed using 10 mm (0.39 in) thick E11 chrome-silicon armor plates hardened to 153 kg/mm2 for protection against shell fragments. The 30 mm (1.18 in) thick front hull was made using face-hardened FA32 armor plates. The rest of the hull was made out of cheaper rolled SM-Stahl (carbon steel) that was hardened to 75-90 kg/mm2. It took 20 mm (0.78 in) thick plates of SM-Stahl to provide equivalent protection against penetration by SmK (7.92 mm AP bullets) as 14.5 mm (0.57 in) of E11 armor plate. 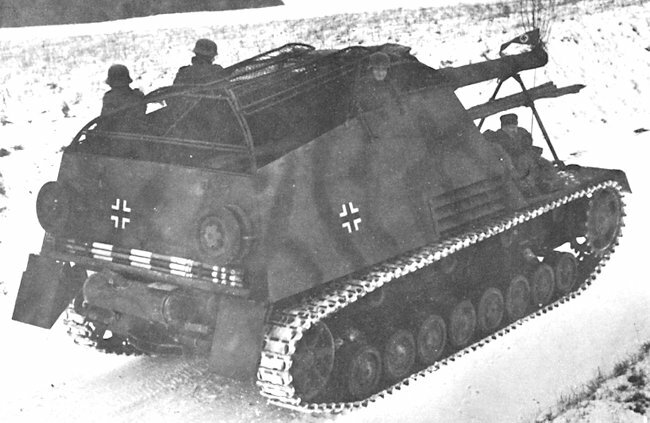 The early Geschützwagen III/IV chassis used the standard 1943 38cm wide SK18 track that had three smooth metal pads visible on the front face of the track. In winter some vehicles were fitted with track width extenders called Winterketten (winter track). These triangular pieces of metal were bolted onto the outer edge of the track to extend the width of the track and help the vehicle move across snow and mud by spreading the load over a larger area. They were problematic: they fractured and often fell off. In 1944, vehicles started to be fitted with the wider Ostketten (east track) to cope with the conditions found on the Eastern Front. The Winterketten extensions made the SK18 tank track 55cm wide. The one-piece Ostketten was 56cm wide and did not have bits falling off it. A Wespe SPG with its 10.5 cm gun. The 105 mm (4.13 in) high explosive HE shell weighed 14.81 kg (32.7 lb). The armor piercing shell weighed 14.25 kg (31.4lb). It had a muzzle velocity of 470 m/s (1,542 ft/s) and a maximum firing range of 10,675 m (11,675 yds). With a good gun crew, it had a rate of fire between 4-6 rounds per minute. 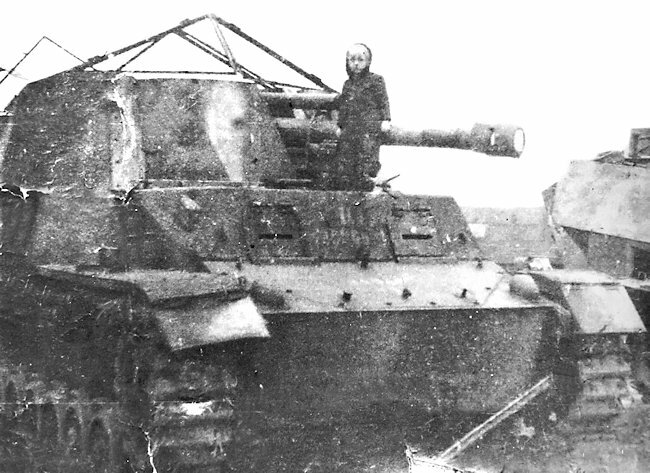 The 10.5cm leichte Feld Haubitze 18 gun was not very useful in the direct-fire mode against enemy armored vehicles. It could only penetrate 52 mm (2 in) of armor plate at a very short range of 500 meters. The high explosive shell was in two pieces. It was a ‘separate loading’ or two part round. First, the high explosive HE projectile would be loaded and then the cartridge propellant case. Depending on the range of the target different sized bags of propellant were inserted into the cartridge. More bags were used for longer range targets. 15cm sIG 33 (Sf) auf Panzerkampfwagen I Ausf. B "Bison"
Hummel and a Wespe illustration, for comparison by David Bocquelet would be fantastic. Great article about a type I didn’t know guys! Just one small point – shouldn’t it say 12+ for production figures on the info bar below the title? Further down it specifically states that 12 are known to have survived the war but only 8 were refurbished to enter Czech service. Jes and John Hummel and Wespe illustrations added. Unfortunately they are not to scale. That is unimportant, as long as they are there thanks.